Good news. Actually, scratch that. GREAT news. This girl officially survived her first semester of nursing school. Lost about one third of my sanity along the way but I made it! I feel as if I owe an explanation as to why I’ve been MIA for the past few months (dusts cobwebs off blog page). The truth is, I honestly never imagined nursing school would be this overwhelming. Before first semester began, I was under the impression that I would take a solid week (two tops) away from my blog just to really get into the swing of things with the whole schedule and assignments and all that jazz. Then I would incorporate my blog biz into the schedule and just like that..things would flow smoothly. BOY. Was I wrong, or was I wrong? Turns out that nursing school wasn’t going to just be something that was an addition to my already crazy life schedule. Nursing school has become my life. Seriously. I spend more time there than I do at my own home. All of that being said, I wouldn’t change it for the WORLD. I love love love my chosen career path, my awesome classmates that have become family and I can’t wait to become the best nurse that I can be. With Summer semester out of the way, thankfully Fall semester isn’t going to be as dreadful and I’ll actually have time to eat home cooked meals again. This means more yummy recipes will be coming atcha, on the blog. Woop Woop! Kicking things off with these l-i-t-e-r-a-l-l-y irresistible Chicken Fajita Stuffed Sweet Potatoes. Cue the droolz. Think of these as sort of like a fajita 2.0. As if fajitas couldn’t get any better….somehow you throw a sweet potato into the mix and all of a sudden, your taste buds spiral into the happiest of happy places. You get all of the mouthwatering flavors of a juicy chicken fajita with a fraction of the carbs of a regular tortilla. Winner, winner, chicken (fajita) dinner. 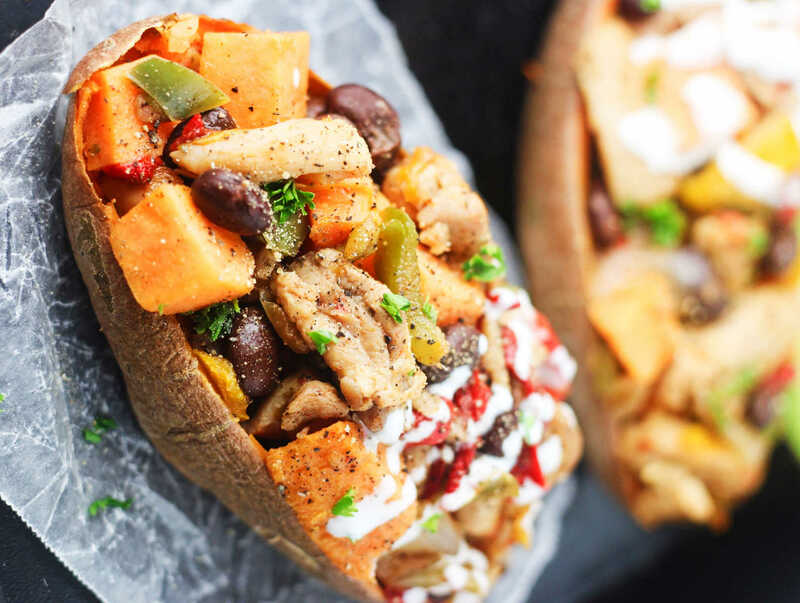 Deliciously flavorful sweet potato skins stuffed with juicy chicken and a combination of peppers and spices. Preheat oven to 400 degrees F. Thoroughly wash sweet potatoes. Using a fork, carefully poke a few holes into the sides of both sweet potatoes and place them in an oven safe glass dish. Bake for 35-40 minutes or until slightly tender on the insides. Chop the chicken breasts into bite sized pieces. Spray large skillet with nonstick cooking spray and cook the chicken on medium-high heat until pieces are fully cooked. Dice the onion and peppers and add to the skillet with the chicken along with black beans, onion powder, paprika, salt and pepper. Continue to cook for approx 5 minutes or until peppers are slightly tender. Remove from heat. Once sweet potatoes are cooked, carefully slice each one in half. Score lines down each cut side vertically and then horizontally to form squares (imagine cutting a mango) and then carefully scoop the sweet potato cubes into a large bowl. Add the fajita ingredients from the skillet into the bowl and fold to combine. Evenly distribute fajita filling into each sweet potato skin and top as desired. Enjoy! Optional toppings: lite sour cream (save even more calories by subbing with plain nonfat Greek yogurt), mozzarella cheese, avocados, cilantro. My husband and I tried this recipe last night, we loved it!! So yummy! :) I had extra of the filling left over so I'm eating it for lunch today.